The Crescent Marble Urn is a beautiful cultured marble urn, carefully handcrafted by Crescent at our facility in Tupelo, Mississippi. 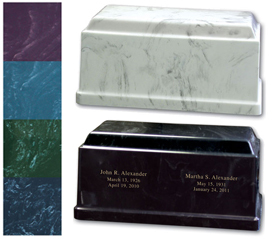 It is available engraved with stock images or custom engravings and is available in many different beautiful colors. The outer dimensions are 11.3” W x 7.9” D x 7.2”H and it holds up to 230 C.I. The Crescent Marble Companion is also handcrafted by Crescent and has two compartments, each holding up to 200 C.I. It is available in Black, White, Navy, Green, Blue or Purple. The outer dimensions are 15” W x 8” D x 7” H. Similar to the standard size, it can also be engraved with a stock image or a custom engraving. Finally, there are also beautiful Crescent Marble Keepsakes available which hold up to 1 C.I. The outer dimensions are 3.5” W x 2.5” D x 2.5” H. These can also be engraved with stock or custom engravings and are available in White, Rose, Black, Green, Blue, Red, Purple and Navy.